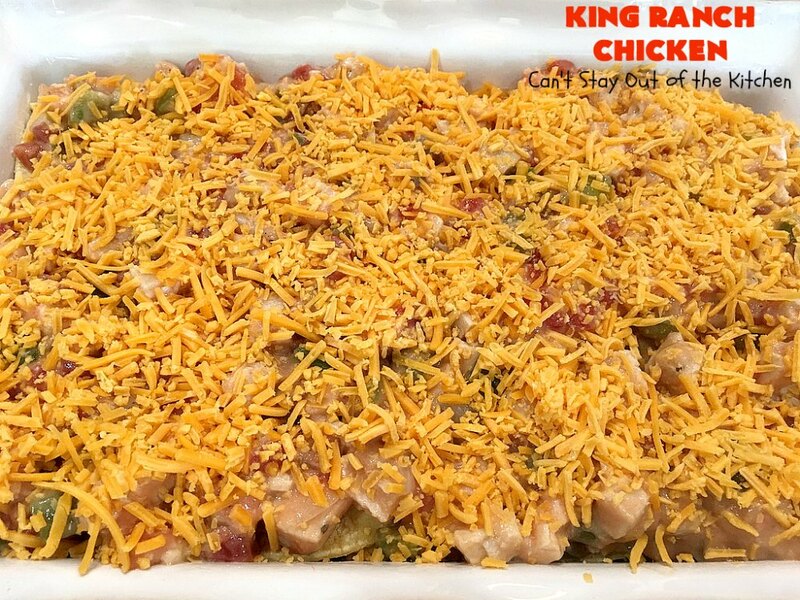 We love King Ranch Chicken! This Texas staple is awesome and very popular in the Lone Star State. 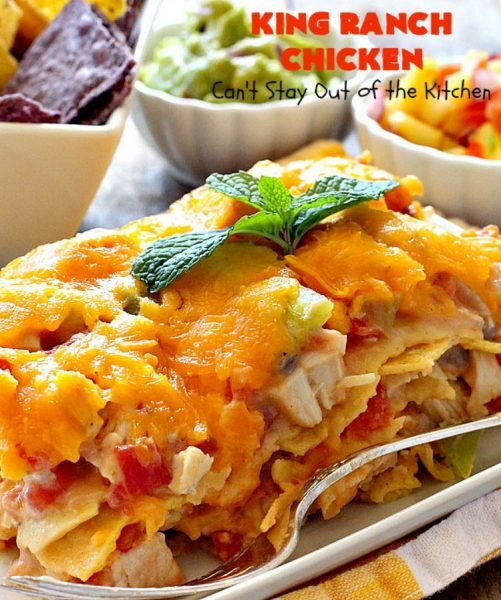 It features a layered casserole with corn tortillas, lots of sharp cheddar cheese and a chicken mixture. 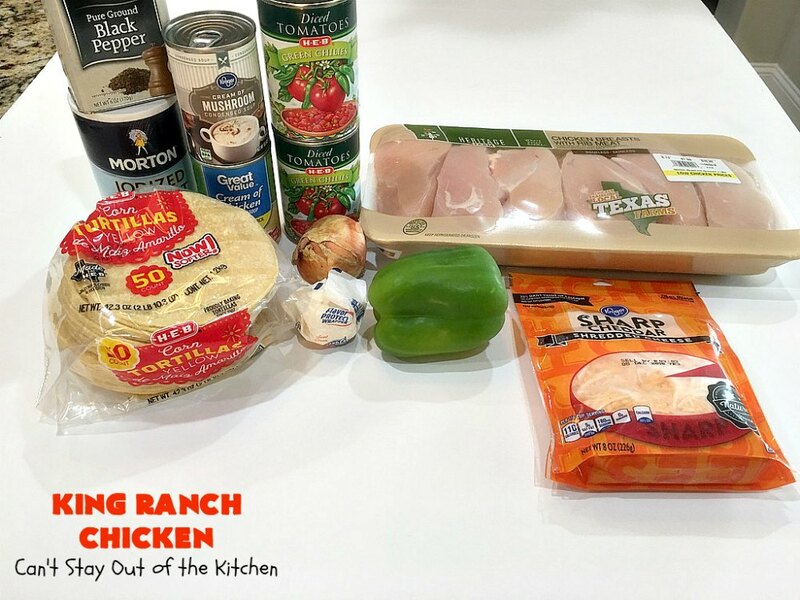 The chicken mixture contains Ro-Tel diced tomatoes and chilies, both cream of mushroom and cream of chicken soups, along with onions and green peppers. This gooey cheesy texture is so fantastic. I got the recipe from a dear pastor’s wife when we attended Southwest Baptist Church in DeSoto, Texas, back in the mid 1990s. We have never once failed to get compliments on this recipe. Kathy was (and is) a fabulous cook. I collected several of her delicious recipes and still make them frequently. But I believe the original recipe comes from Ro-Tel (maker of canned tomatoes with diced chilies and other great products). It is pretty easy to make and assemble. I usually make it ahead of time. Then I put it on a time-bake, and it’s ready when we get home from church on Sundays or other busy times. 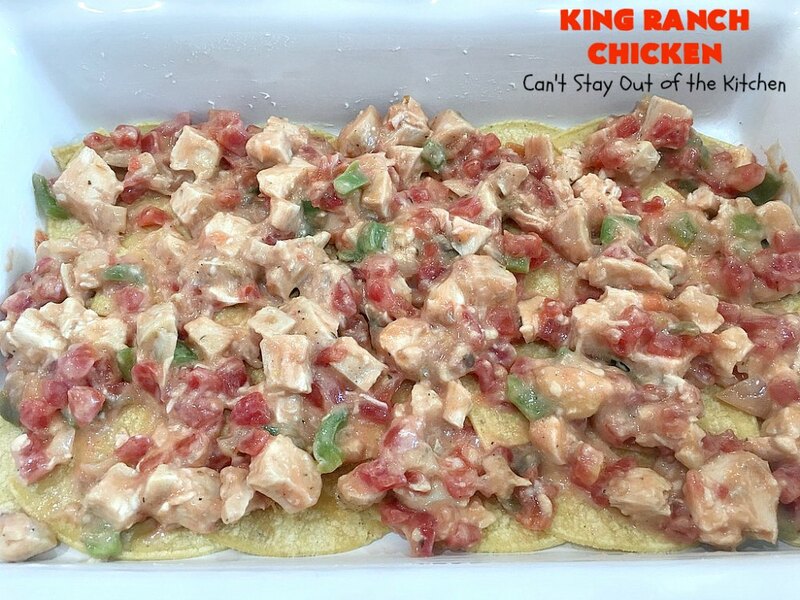 The recipe I got from Kathy is only slightly different from the original Ro-Tel recipe. If you’re looking for a great Tex-Mex recipe this casserole is superb! 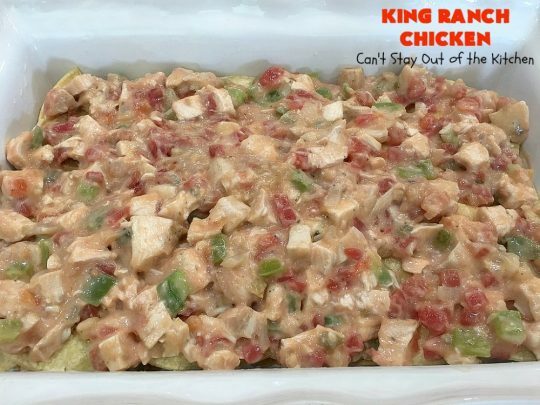 When I initially posted this recipe in June of 2012, I had only been posting to my food blog for a day! My pictures were taken with a poor quality iPhone 3 because that’s the only camera I had available at the time. The pictures were blurry, grainy and dark. I recently remade this recipe (January 2015) for company and it got rave reviews. I served King Ranch Chicken with Savory Butternut Squash Bake and we certainly enjoyed everything. 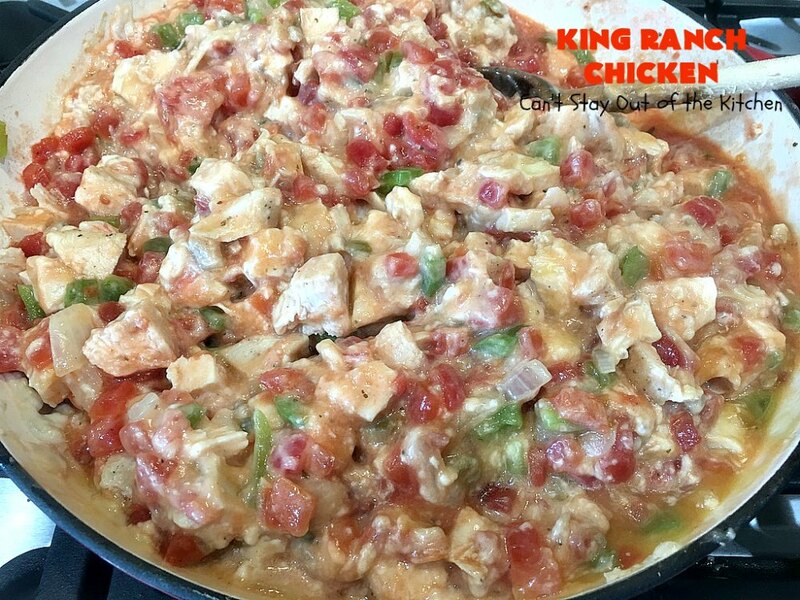 I’ve updated the pictures so you can get a better idea of what King Ranch Chicken is supposed to look like. 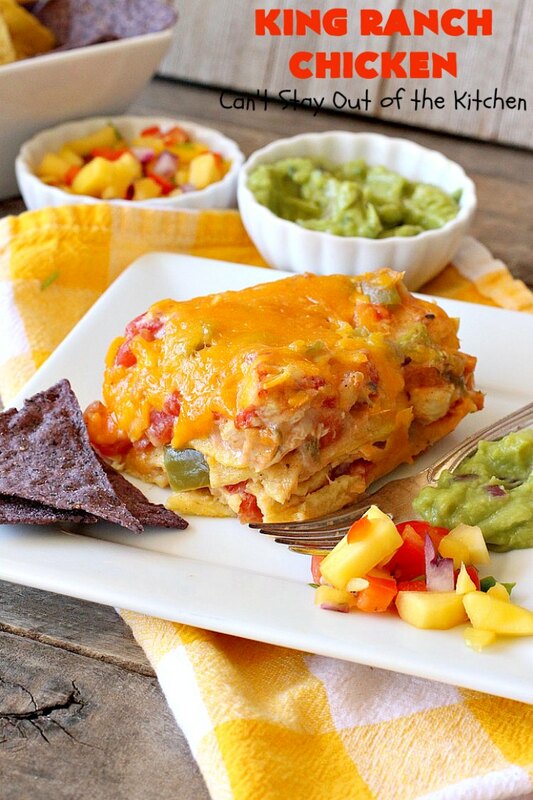 King Ranch Chicken is one of our favorite Tex-Mex entrees. It’s perfect for company dinners or potlucks. 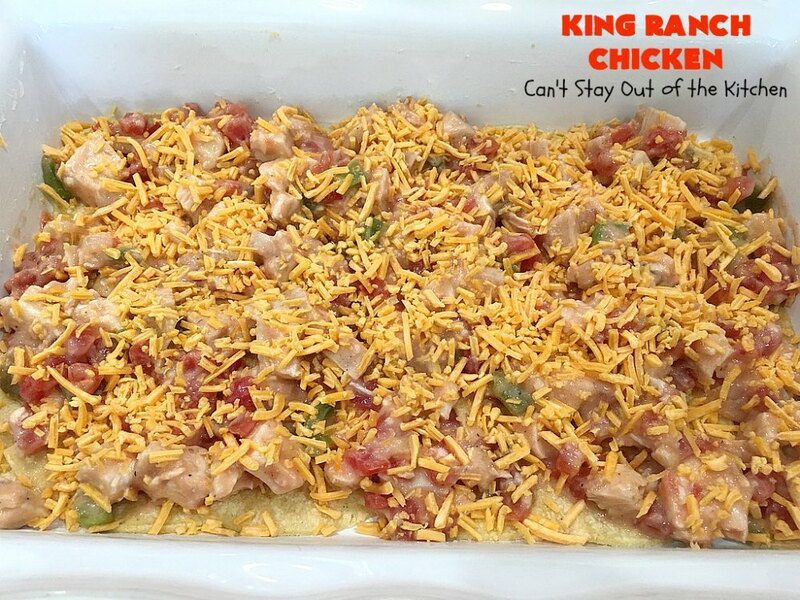 King Ranch Chicken is one of the BEST Tex-Mex Casseroles we’ve ever eaten. There’s lots of juicy chicken in the sauce. 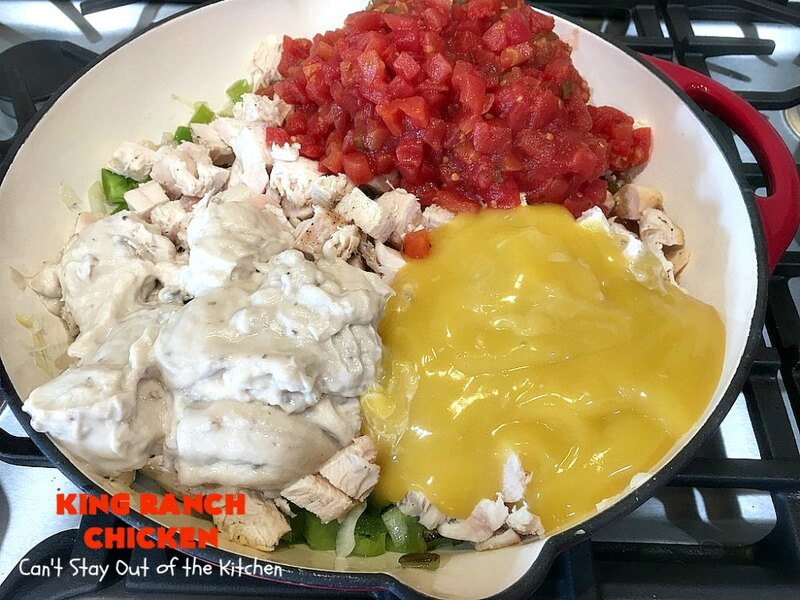 The sauce contains creamed soups, diced tomatoes and chilies, peppers and onions, layered between corn tortillas and cheese. 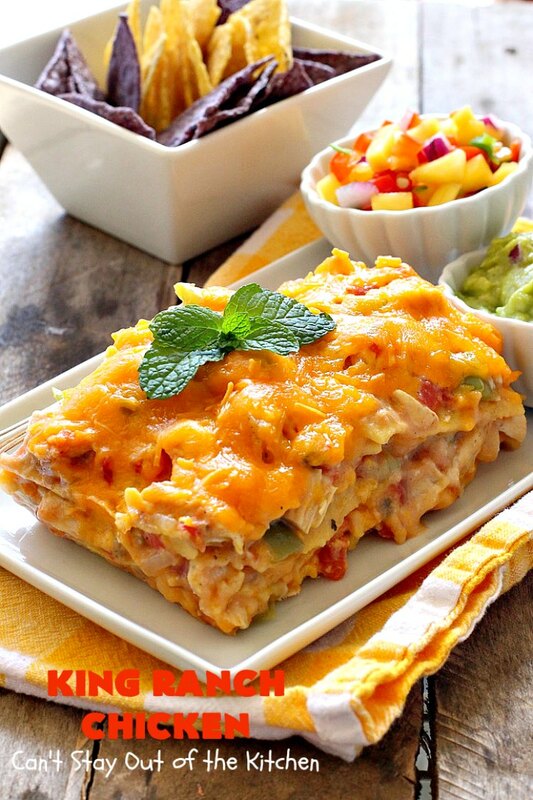 It’s wonderful served with Mango Salsa and Guacamole. 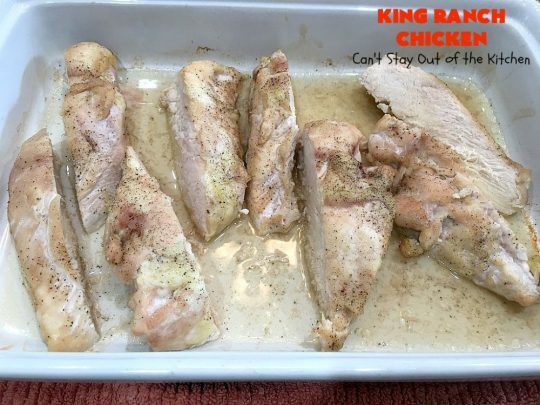 Place chicken breasts in a baking dish. Sprinkle with salt and pepper. Bake at 350 for 30-45 minutes or until cooked through. 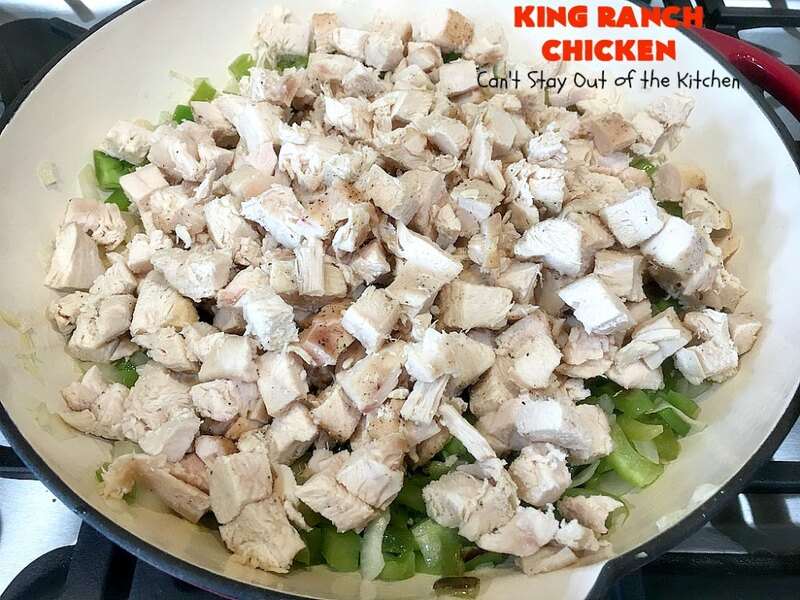 Cut down chicken and cube. Set aside. Meanwhile, make filling ingredients. Melt butter in skillet. Add diced green pepper and diced onion and saute veggies. Once veggies are fork tender, remove from heat. Add cream of chicken soup, cream of mushroom soup, and Ro-tel diced tomatoes with green chilies. Stir everything together and sprinkle with more salt and pepper, if desired. Spray baking dish with cooking spray or grease with butter. Cut corn tortillas in quarters. Spread to cover the bottom of the pan. 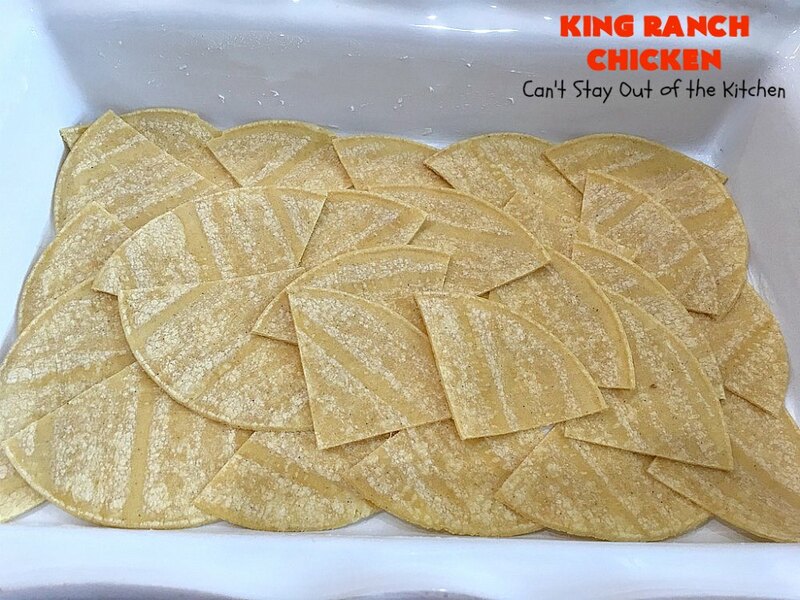 Spread one-third of the chicken mixture over top of the corn tortillas. Spread another layer of corn tortillas over top. 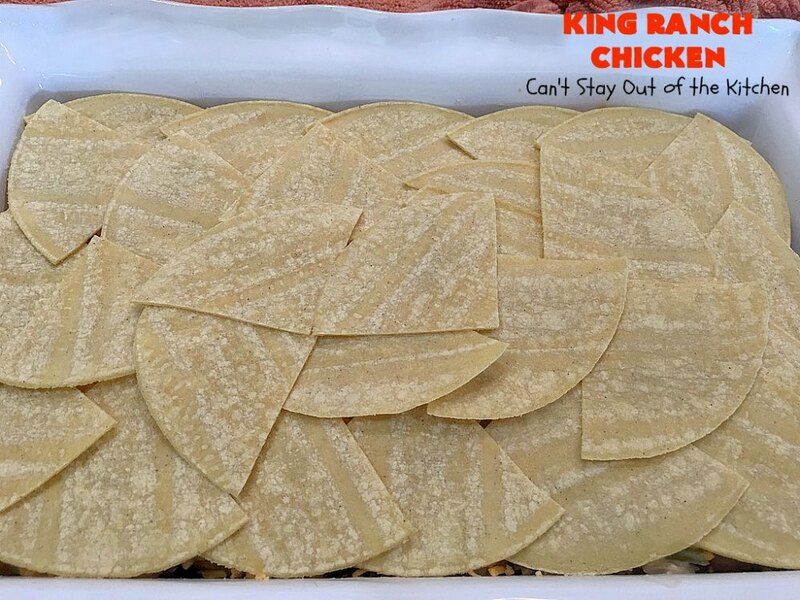 Spread another third of the chicken mixture over top of corn tortillas. 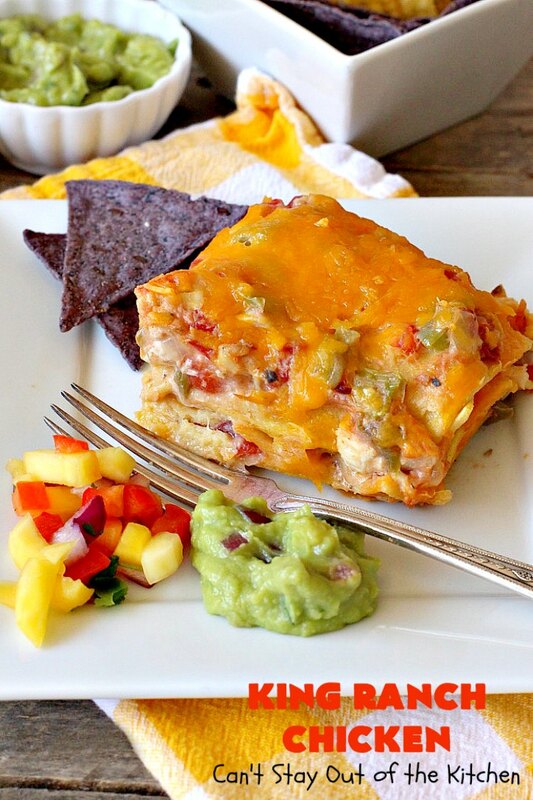 Spread another layer of corn tortilla triangles on top of cheese. Spread remaining chicken mixture over top of tortillas. 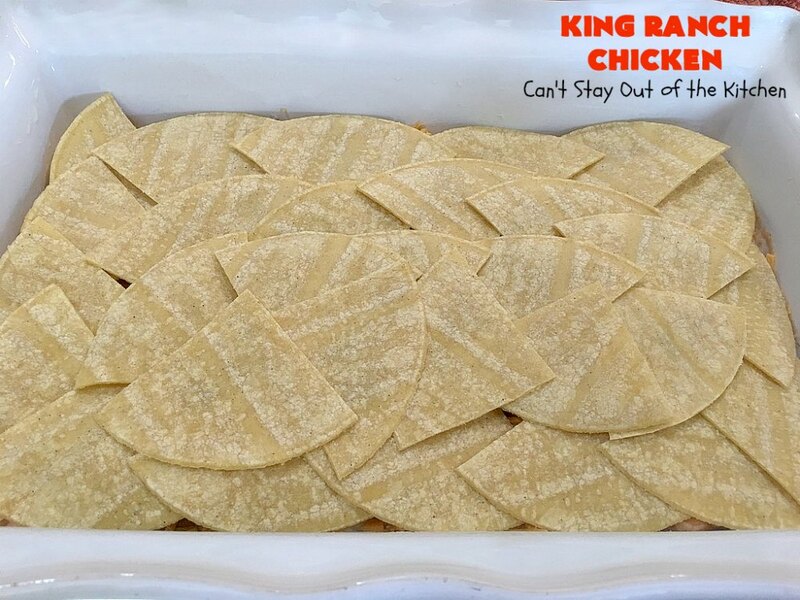 Cover with foil and bake at 325 for 35-45 minutes–or until hot and bubbly. Bake about 3-5 minutes more until cheese melts. King Ranch Chicken is absolutely spectacular. 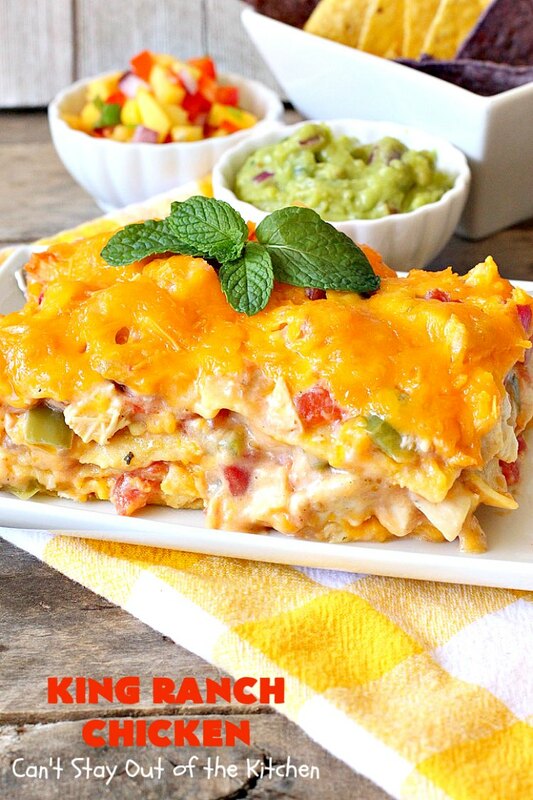 This cheesy chicken dish is first rate. We enjoy it with Mango Salsa and Homemade Guacamole. We love King Ranch Chicken and we think you will too. 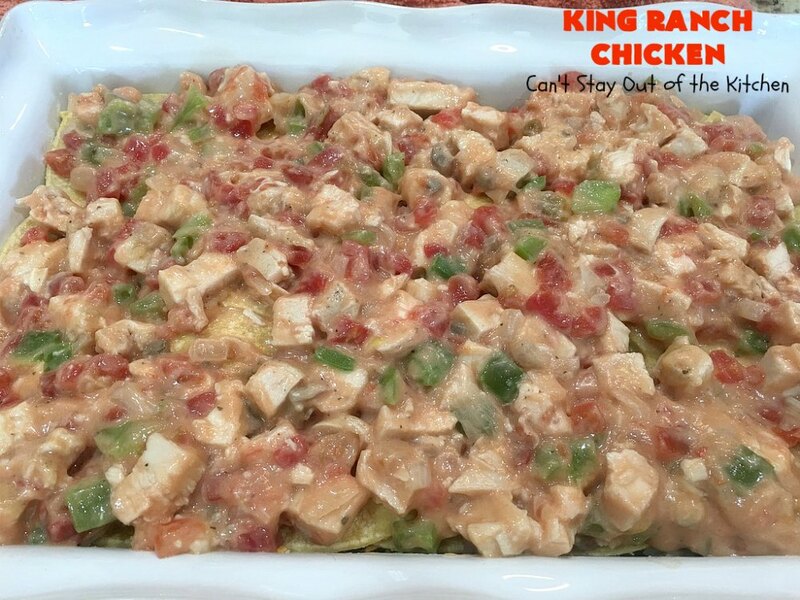 Every time we serve King Ranch Chicken to company they also enjoy this great recipe. This fabulous Tex-Mex casserole is as good as it gets! 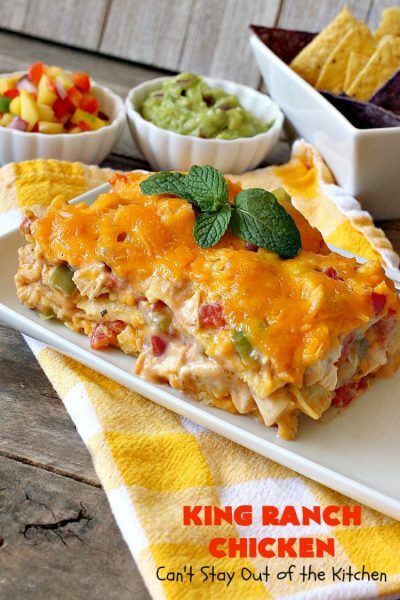 It's layered with corn tortillas and contains chicken, diced tomatoes with green chilies, cream of mushroom and chicken soup and lots of cheese! 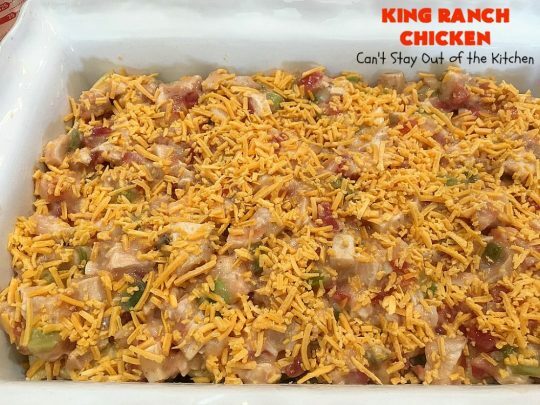 This is a terrific casserole for company. Sprinkle chicken with salt and pepper; place in a 9x13” baking dish. Bake at 325° for 40-45 minutes or until done; cool. Coarsely chop chicken and set aside. 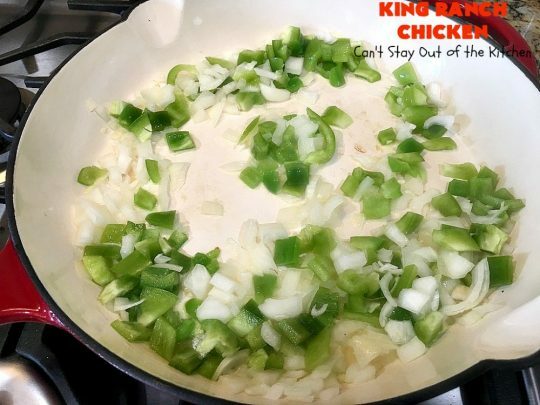 Add chopped onion and green pepper and cook, stirring mixture constantly, until vegetables are crisp-tender. Remove from heat, and stir in chicken, tomatoes with green chilies, and soups. 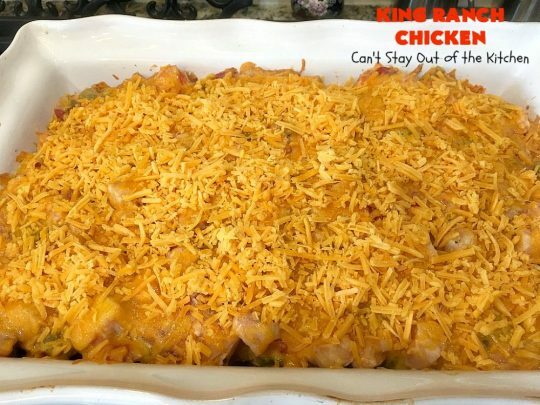 Place one-third of tortilla quarters in bottom of a lightly greased 9x13” baking dish; top with one-third chicken mixture, and sprinkle evenly with 2/3 cup shredded cheese. Repeat layers twice, reserving 2/3 cup cheese. 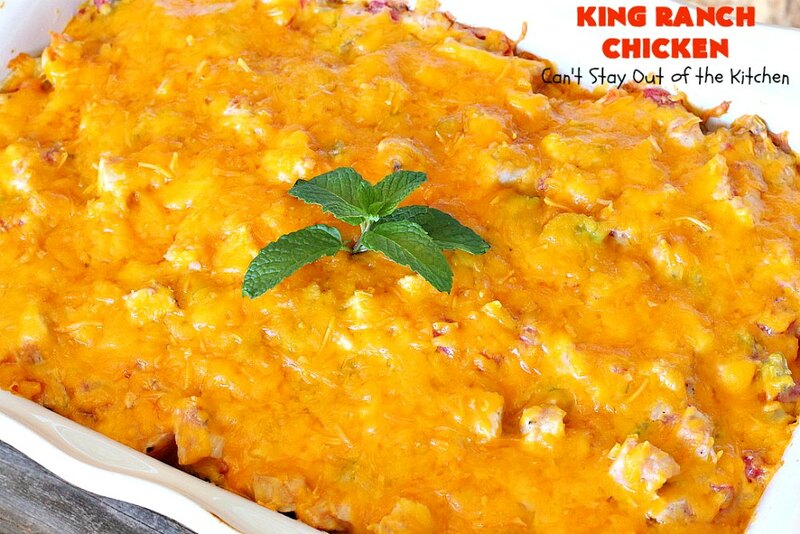 Bake at 325° for 35-45 minutes; sprinkle with reserved cheddar cheese, and bake additional 5 minutes. Let stand 5 minutes before serving. NOTE: I use 3-4 cups of cheese and spread it between each layer. NOTE: My chicken breasts were fairly large. It took 60 minutes before they were cooked completely. NOTE: I used 14.5-oz. cans diced tomatoes with green chilies. It makes the entrée a little more tomatoey and a little spicier from extra green chilies. 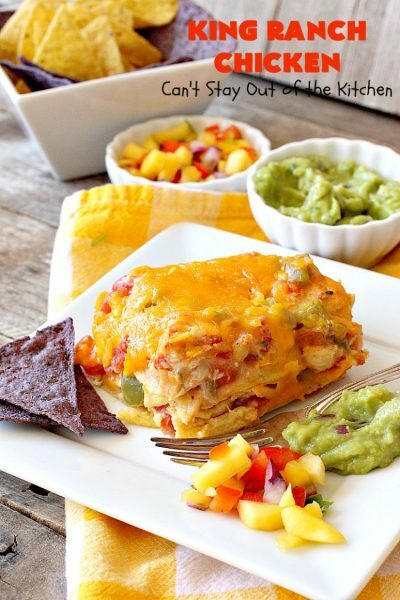 This fabulous Tex-Mex casserole is as good as it gets! It’s layered with corn tortillas and contains chicken, diced tomatoes with green chilies, cream of mushroom and chicken soup and lots of cheese! 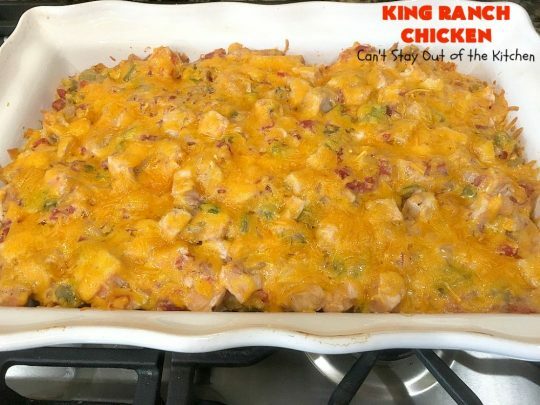 Sprinkle chicken with salt and pepper; place in a 9×13” baking dish. Place one-third of tortilla quarters in bottom of a lightly greased 9×13” baking dish; top with one-third chicken mixture, and sprinkle evenly with 2/3 cup shredded cheese. I use 3 cups of cheese and spread it between each layer. This creamy casserole is so succulent and delectable. 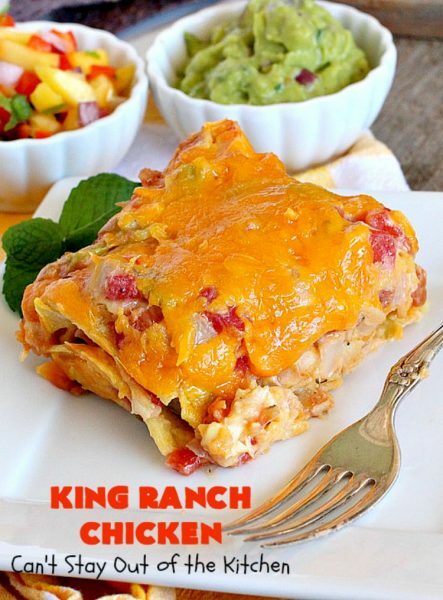 If you like Tex-Mex your family will love King Ranch Chicken. King Ranch Chicken is a zesty Tex-Mex casserole that will have you and your family wanting more! Thanks, Lenore. It is pretty easy. If you have leftover rotisserie chicken on hand you can use that too. I’ve made up the filling ingredients before (even a day ahead) and then assemble everything right before I put it in the oven. Can’t assemble ahead of time or the tortillas get really soggy. Also, this unfortunately does not freeze well, so plan on eating leftovers! Hope you enjoy it.